Peter Temin tells the story in a new paper called The Rise and Fall of Economic History at MIT. Economists study how society produces and distributes its scarce resources. Why things are made and how they flow. He wants it all, what to forego. Through greed a solution appears. Profits are earned by serving peers. Become experts in their domains. Through trade the rest they obtain. But their profits diverge by much. Those with great tools earn a whole bunch. Boost production so very much. John Cochrane has a great column in today's Wall Street Journal on how to create a better banking system. He says that we should focus on the nature of bank liabilities (demand deposits, in particular) rather than on the riskiness of bank assets. Traditional banks are peculiar institutions. Traditional banks have depositors who want short-term, liquid, riskless assets. Yet these deposits are backed by long-term, illiquid, risky loans. This incongruity is fundamental. As we have seen, it cannot be easily fixed by a government policy such as deposit insurance. There is, however, a simple, market-based solution: mutual funds. Individuals who want truly riskless assets can invest in mutual funds that hold only Treasury bills. Those who are willing to undertake greater risk can invest in mutual funds that hold privately issued CDs, bonds, or equities. Long-term, illiquid loans could be made by finance companies, which would raise funds by issuing equity and bonds. In the world I am describing, all household assets would be perfectly liquid. Preventing bank runs---he original motivation for deposit insurance--would be unnecessary, because changes in demand for various assets would be reflected in market prices. In essence, the system we have now is one in which finance companies are themselves financed with demand deposits. Yet these finance companies hold assets--long-term bank loans--that are risky and illiquid, much in the same way that fixed capital is risky and liquid. Imagine that the auto industry financed itself with demand deposits. Undoubtedly, self-fulfilling "runs" on GM and Ford would be common, and the auto industry would be highly unstable. Indeed, the auto industry would probably be a major source of macroeconomic instability. The best solution, of course, would not be deposit insurance and regulation of the auto industry, but a change in the way the industry financed itself. We believe that the U.S. evidence on income and wealth shares for the top 1 percent is most consistent with a “superstar”-style explanation rooted in the importance of scale and skill-biased technological change. In particular, we interpret the fact that the top 1 percent is spread broadly across a variety of occupations as most consistent with an important role for skill-biased technological change and increased scale. These facts are less consistent with an argument that the gains to the top 1 percent are rooted in greater managerial power or changes in social norms about what managers should earn. Paul Krugman, commenting on my recent article, thinks it is noteworthy that the rich have increased their spending on child enrichment programs. To me, that is not a surprise. The incomes of the rich have risen, and this category of spending, like many others, has a positive income elasticity. I am a parent of three, and as far as I know, Paul does not have any children. So I have probably spent a lot more on this category than he has. And I can report that much of it is consumption, not investment. A book I probably should have cited in my article is Judith Harris's The Nurture Assumption. The main thesis of this great book is that, beyond genes, parents matter far less than most people think. Raising three children has made me appreciate Harris's conclusion. It is frustrating how little influence we parents have. I have a friend whose job it is to advise families of extreme wealth. She is often asked how to raise successful children who know they are going to inherit gobs of money. It is all too common to see kids raised in this environment becoming ne'er do wells. Her advice: Make sure they get a summer job. Rather than spending money on enrichment activities, have them learn what it is like to earn a living. I was utterly and totally wrong – a situation I have become accustomed to. Mankiw’s first year textbook is clear, to the point, and is honest about what the economic method is and what it achieves. He “wears his assumptions on his sleeve” which I have learnt is the distinction of the best type of economist. His textbook, and his papers on macroeconomics and tax, have been insightful for me as a way of not just understanding economic ideas, but of understanding the economic method. Click here to read my new essay "Defending the One Percent," which is forthcoming in the Journal of Economic Perspectives. Update: A friend points out, "Actually, we have had an all-Harvard CEA for some time since Betsey is replacing Katharine Abraham (a Harvard Ph.D.) and Jason is replacing Alan Krueger (a Harvard Ph.D.)." Update: Here the President's announcement of Jason's appointment. Paul Krugman says a Heritage Foundation economist is dishonest. Steven Landsburg says, not so fast. 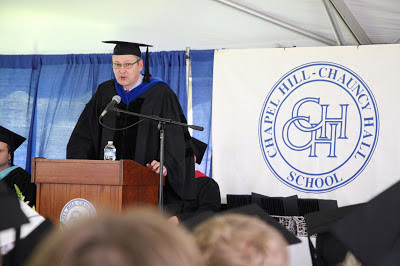 This morning I gave the commencement address at the Chapel Hill-Chauncy Hall School, from which my older son just graduated. You can read the speech here. Update: A video is posted here.